Global carbon emissions projected to stall in 2015: What are the implications for European climate change policy? | Environmental Europe? Today, the Global Carbon Project (GCP) released the 2015 version of the Global Carbon Budget, which provides estimates for global carbon dioxide emissions from fossil fuel combustion, industrial processes, and land use change. I sat down with Professor Corinne Le Quéré, who led the 2015 Global Carbon Budget release and is the Director of the Tyndall Centre for Climate Change Research, to talk about this year’s results and their implications for international and European climate policy. Brendan Moore: What are the key messages coming out of the Global Carbon Budget 2015? Corinne Le Quéré: The most important message is related to carbon dioxide emissions from fossil fuel use and industry. Over the last ten years, these emissions had been rising very rapidly, by 2.4% per year on average. And that has changed now, at least for the last two years. 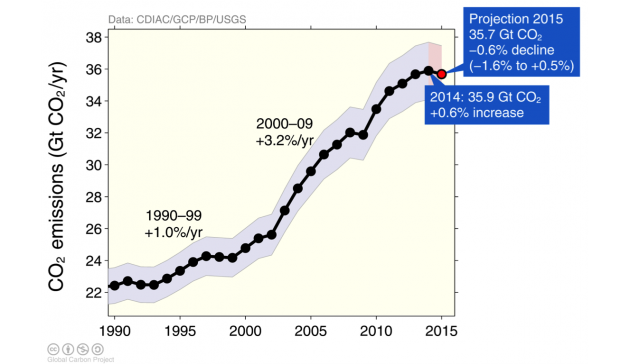 Our estimate is that in 2014, these emissions grew much more slowly, by 0.6%. Our projection for 2015 – based on a range of data and assumptions – is that emissions will decrease by –0.6%, although with a large degree of uncertainty. The stalling of emissions from fossil fuel use and industry over these two years takes place in the context of strong global economic growth. So this is really different from what has happened in the past ten years, essentially showing a break in the growth of these emissions. Global carbon dioxide emissions from fossil fuel and industry. Source: GCP 2015. BM: And what are the drivers of that change? CLQ: The primary reason why the emissions have essentially not grown in the past two years is because of what is happening in China. China’s GDP growth has had very rapid growth for ten years. And in 2015 it appears to be slowing down below 7%. For most countries such a growth rate would be incredible, but for China it is a slowdown. And that slowdown is driving a decrease in coal use in China. But interestingly, China is increasingly replacing coal with renewable resources. At least in 2014 where we have detailed data, 58% of the growth in China’s primary energy consumption came from non-fossil fuel sources (hydro, nuclear, and other renewables), and the rest from oil and gas. This is really interesting, because it means that in addition to the slowdown in China’s economy, there are also indications of a possible move away from coal. And it’s not just China. In Europe and globally, there is also a very important rise in renewable energy, particularly wind, hydro, and solar energy. And not so much nuclear. Actually, if anything nuclear has gone down a little bit globally. However, it is unlikely that emissions have peaked for good because the main driver of the break in the past two years is the economic readjustment in China. In the next few years, the restructuring in China will be the main source of uncertainty in the growth in global emissions. In the longer term, emissions growth could be dominated by the energy needs of emerging economies that still rely primarily on coal. And emissions decreases in some industrialized countries are still modest. BM: What are the implications of these findings for the COP21 climate summit currently taking place in Paris? CLQ: I think this is encouraging for the negotiations for two reasons. First, because it means that there is a real opportunity to push forward and to accelerate the peak and decline in global emissions. And second, because the very high growth in emissions has ceased for two years, we have evidence that the mountain in front of us to decarbonise our energy system is perhaps not as big as it was before, so to speak. I think that if the Paris negotiations lead to a very strong message, then we could see things starting to change rapidly in terms of global emissions. Perhaps not immediately though. What is going to determine the emissions in the next few years is really the economic rebalancing in China and the immediate drivers of energy needs that are already in the pipeline. But from 2020 onwards, the Paris agreement will really make a difference to how seriously climate mitigation is taken on-board by governments, businesses, and the public in general. BM: As you know, our blog is focused on environmental policy in Europe. What are the implications of these findings for European leaders (at EU, national, and local levels) over the next five to ten years? CLQ: European emissions as a whole have been decreasing for a while now, and faster in the last ten years compared to before. Europe so far has always been a world leader in decarbonisation. But moving forward, the EU’s current INDC commitments are really not any more ambitious than the commitments of many other countries around the world, at least not when measured according to the annual change in carbon intensity of the economy. Europe could lose its leadership unless it moves up one gear and further accelerates its transition to a low-carbon economy. Europe also has a big opportunity to export its know-how, because it has successfully implemented many decarbonization policies across its economic sectors. As other countries go down that route – especially the emerging economies – I think that Europe has an opportunity to share knowledge and to introduce policies that also encourage decarbonisation elsewhere. BM: Is there anything else you would like to add? CLQ: It has always been clear from the science that emissions need to go down to near-zero to limit climate change at any level of warming. And to limit climate change to 2° Celsius, those emissions have to go down very, very quickly. So even though, over the last two years, emissions have not grown as much as before, we are still a long way from near-zero emissions. We are at 36 billion tonnes of CO2 now, and that is only CO2 from fossil fuels and industry. There are other greenhouse gases, and there are other sources of CO2 such as deforestation. So we need to put the emissions trend from the past two years in perspective. We need to realize that we have very high current emissions and that getting to near-zero emissions will require a massive change in the way that we use and produce energy. Further information about the findings discussed in this interview can be found on the Global Carbon Project website. A commentary by Jonas Schoenefeld and Róisín Moriarty on the GCP’s 2014 data can be found here. This entry was posted in Energy & Climate Change, Environment, Politics & Public Policy, Science & Technology, The EU, Uncategorized and tagged carbon dioxide, climate change, European Union, UNFCCC. Bookmark the permalink. Next: The Volkswagen Scandal: What could the short-term impact be on EU policy?